Following the move into their new corporate headquarters, the law firm of Baker and Rannells, P.A., Intellectual Property Attorneys celebrated with an Open House. The new Baker and Rannells headquarter offices are located at 92 East Main St. Somerville, NJ. Stephen Baker, Senior Partner and President, is confident the new location will support his belief that it is essential his firm remains well rooted its community. Stephen also feels the new location better reflects the personality of the firm. The open house took place on December 1, 2016 at the Somerville, NJ location. In attendance were elected town officials from Somerville, members of the Somerville Downtown Alliance, officers of the Somerset County Business Partnership, numerous local downtown business owners and many of Baker and Rannells’ current clients and vendors. 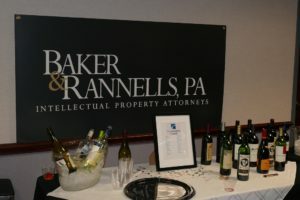 For more information please contact Baker and Rannells, PA at www.tmlawworldwide.com.